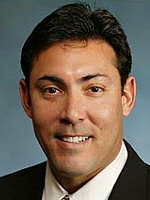 Jew or Not Jew: Ruben Amaro Jr.
We're not big Phillies fans here at JONJ. We rooted for them in the 2008 World Series, more out of a sense of pity than anything else. Plus Chase Utley's cool. So there's that. We do tend to like smart baseball teams, though we'd be hard put to describe the Phillies as one of those. However we may have something to celebrate soon since Ruben Amaro Jr. — Philadelphia's new General Manager following the retirement of Pat Gillick — has already been anointed as one of the great, young baseball minds by the many circles that surround the game. Whether or not that is the really case, well, we'll soon find out. 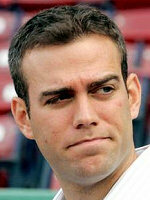 If Amaro gives 1B Ryan Howard a multi-year, multi-millions contract then there's our answer and we can look forward to another 28 years of misery in the City of Brotherly Love. So what are we big fans of? Why, Jews, of course! And somehow (and we really do have no idea how) we've got at least half of one here. Now that's the kind of unexpected surprise we're happy to stand up and cheer for.